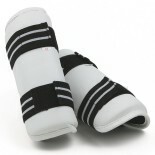 Vinyl forearm guard with two wide hook and loop velcro closures. Constructed with a soft vinyl exterior and thick padding inside. 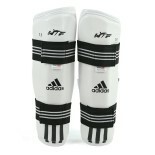 Size: CHS, CHL, S, M, L, XL Color: White ..
Vinyl forearm guard with two wide velcro fasteners. Constructed with soft vinyl outside and thick padding inside. 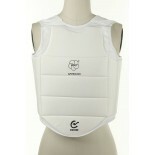 Color: White Size: CHS, CHL, S, M, L, XL .. 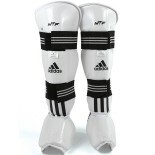 This Adidas Forearm Protector provides maximum protection for the Martial Artist. Five vinyl covered sections efficiently absorb and disperse impacts. 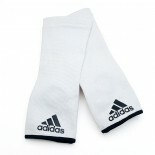 Provides a comfortable fit, with its design wide at the elbow and narrow towards the wrist. 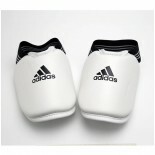 Matches the Adidas Shin Protector (item 150A) • Color: White. • Size: XXS, XS, S, M, L, XL • Material: Vinyl, Sponge .. Features a design that absorbs and disperses impacts extremely well. A thick foam padded insert offers superior protection against powerful strikes. Circular elastic bands and velcro fasteners keep the guard in position. 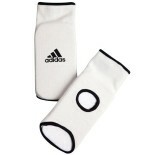 Matches the Adidas Forearm Protector (item 150A) • Color: White • Size: XXS, XS, S, M, L, XL. • Material: Vinyl, Sponge. 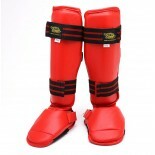 ..
To protect your shins and feet from the impact of a landed kick, this package covers your lower legs and the tops of your feet in contoured padding to absorb and dissipate blows. • Color: White • Size: XXS, XS, S, M, L, XL. • Material: Vinyl, Sponge. .. Ideal for contact training. This product guarantees significant shock absorption. Two hook and loop fasteners secure instep to foot. 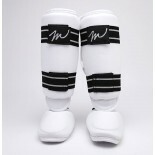 Pairs well with item 119W (white forearm guard) Size: CHS, CHL, S, M, L, XL Colors: BLACK, RED, WHITE .. Ideal for contact training. 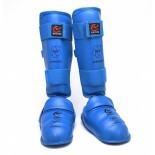 Detachable shin and instep protector gives the user the freedom to choose their desired set up. 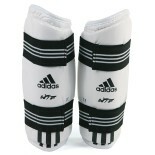 Hook and loop (Velcro) fastener connects shin guard and instep protector, allowing easy wear and removal. High density foam rubber provides exceptional shock absorption, and can endure countless blows while maintaining a high level of protection. Durable vinyl cover and quality construction ensures a lo..
Protects your instep from the impact of a landed kick. Covers the tops of your feet in contoured padding to absorb and dissipate blows. • Size: XS, S, M, L, XL • Color: White .. The Adidas elastic instep protector helps guard your instep area from injuries resulting from high impact. Made with a comfortable elastic material, these instep protectors give you a snug fit while allowing your skin to breath. • Size: S, M, L, XL • Color: White • Material: Elastic textile, polyester fabrics ..
Protects by providing support to the ankles via compression. Flexible structure allows for full range of motion. • Size: S, M, L • Color: White ..